G-Force Aerobatics provides top-class exciting and dynamic aerobatic displays flown by Chris Burkett, usually performing in his high performance single seat Extra 300S. Based in the UK, Chris performs solo aerobatic displays, and close formation aerobatic team displays with other world class pilots, at UK and major international events. Chris also performs a unique “Little and Large” Extra Duo display with Mike Williams, who flies a 40% scale radio controlled model of the G-Force Extra. At its debut in 2013 their display was voted a “Top Ten Airshow Moment of the Year” by UK Airshow Review. The G-Force Aerobatics’ Extra has been spanning the globe to display at high profile international events. A recent highlight was the 2014 Bahrain International Airshow, appearing in the colours of the world’s largest courier company, DHL. 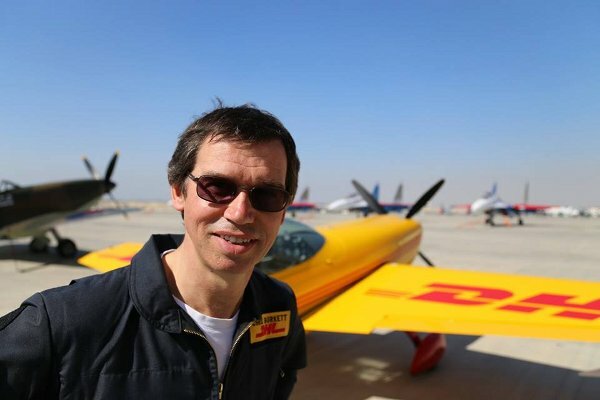 Chris joined with the British Aerobatic Academy’s chief pilot Adrian Willis to create the DHL Aerobatic Team. Their display included a formation flypast with the DHL Boeing 757, and was voted “Best in Show” by Bahrain TV. Read the full story here. Chris also displays as a team member of the Global Stars aerobatic team. Their most recent trip was to China, to help Skoda Cars launch the latest generation of the Skoda Octavia onto the Chinese market. The team is led by Mark Jefferies, multiple UK National Aerobatic Champion. Flying with Mark and Chris in China were hugely experienced aerobatic display pilots Tom Cassells and John Taylor. The Global Stars four-ship Extra display was the first time that an aerobatic display has been the feature of a product launch in China. Read more about their adventures here.